Associate of, converted by, and disciple of Saint John the Apostle. Friend of Saint Ignatius of Antioch and Saint Papias; spiritual teacher of Saint Irenaeus of Lyon. Fought Gnosticism. Bishop of Smyrna (modern Izmir, Turkey). Revered Christian leader during the first half of the second century. The Asia Minor churches recognized Polycarp's leadership and chose him representative to Pope Anicetus on the question the date of the Easter celebration. Only one of the many letters written by Polycarp has survived, the one he wrote to the Church of Philippi, Macedonia. 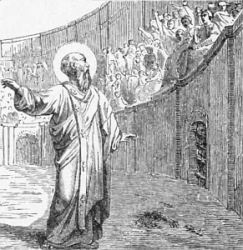 At 86, Polycarp was to be burned alive in a stadium in Smyrna; the flames did not harm him and he was finally killed by a dagger, and his body burned. The Acts of Polycarp's martyrdom are the earliest preserved reliable account of a Christian martyr's death. Apostolic Father. When the pyre was ready, Polycarp took off all his outer clothes and loosened his under-garments. There and then he was surrounded by the material for the pyre. Whey they tried to fasten him also with nails, he said, "Leave me as I am. The one who gives me the strength to endure the fire will also give me strength to stay quite still on the pyre, even without the precaution of your nails." So they did not fix him to the pyre with nails, but only fastened him instead. Looking up to heaven, he said, "Lord, almighty God, Father of your beloved and blessed Son Jesus Christ, through whom have come to the knowledge of yourself, God of angels, of powers, of all creation, of all the race of saints who live in your sight, I bless you for judging me worthy of this day, this hour, so that in the company of the martyrs I may share the cup of Christ, your anointed one, and so rise again to eternal life in soul and body through the power of the Holy Spirit. "I praise you for all things, I bless you, I glorify you through the eternal priest of heaven, Jesus Christ, your beloved Son. Through him by glory to you, together with him and the Holy Spirit, now and for ever. Amen." 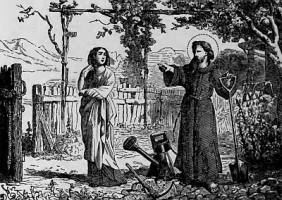 Serenus abandoned his home and people to live as a hermit in Sirmiun, Pannonia (modern Hungary) where he directed his thought to prayer, his labour to working a garden of fruit and herbs. One day he found a woman and her daughters walking in the garden around noon. He recommended they withdraw, and return in the cool of the evening, but the way he said it led her to believe he was simply chasing them out. The woman's husband was an imperial guard, and he convinced Emperor Maximian to avenge this imagined insult. Serenus was arrested and brought to trial, but simply repeated what he had said, and was immediately acquitted. However, his demeanor led the judge to suspect that Serenus was a Christian, which was illegal. When questioned about it, Serenus admitted his faith. He was ordered to sacrifice to pagan gods; he refused, and was sentenced to death. His story was very popular in times past due to his being a simple man brought to ruin not through any fault of his own, but as a result of the arrogance of the ruling class, a theme which has resonated in many an age, and because many writers and preachers liked to use the metaphor of the garden as an example of a proper Christian life. Son of a wheelwright. Well educated. Priest. Canon at Hildesheim, Germany. Noted speaker. Chaplain to Emperor Otto II. Chancellor of Germany in 971. Archbishop of Mainz, Germany in 973. Archchancellor of the Holy Roman Empire in 975. Vicar apostolic to Germany in 975, ordained by Pope Benedict VII. He crowned the infant Otto III as Holy Roman Emperor in 983, and served in the regencies of Empress Theophano and Empress Adelaide. Assisted at the consecration of Pope Gregory V in 996. Participated in the synod in 996, and spoke for the return of Saint Adalbert of Prague, whom he had consecrated as bishop, to his diocese. Worked to insure the choice of Emperor Henry II in 1002, and consecrated the the emperor. Presided at the Synod of Frankfort in 1007. He sent missionaries to Scandinavia, founded churches, built roads and bridges, supported artists and monasteries, and rebuilt the cathedral of Mainz. Though he was known as a brilliant statesman and politician, he was a Church man first, and was also known for the care he took in educating priests, and choosing them for their assignments. The fifth of ten children born in the family of a pious coal miner. Early feeling a call to the priesthood, Ludwyk entered the seminary in Heiligenkreuz in his teens; when there was a break in the classes, he would go home to work in the mines to help support his family. Joined the Society of the Divine Word. He continued his theological studies at the Pontifical Gregorian University in Rome, Italy. Ordained a priest on 30 October 1932. Served three years as director of novices at the Chludowie monastery near Poznan, Poland where he taught theology, and became rector of the house. When the German army invaded Poland in 1939, Father Ludwyk came into immediate conflict with the Gestapo for trying to defend his novices against Nazi demands and propaganda. He was arrested on 25 January 1940, and assigned to barracks 7 at the Poznan death camp. Between bouts of torture, Ludwyk ministered to other prisoners until the Nazis finally gave up trying to break him and simply killed him. Martyr. When his mother was pregnant with Giovanni, she was enslaved and taken to Palermo, Sicily by Saracen raiders; his father was killed in the same attack. At age 14, Giovanni returned to his parent’s home town of Stilo, Italy and was baptized by his bishop, Giovanni, at one of the old monasteries around the town. The area Christians, including the bishop, were surprised and suspicious that a young man dressed as an Arab wanted to become a Christian. As an adult, Giovanni was drawn to religious life, and became an Eastern style monk. He would help reapers in the field and then give all he had earned to the poor. A miracle worker, he once prayed for help to save a harvest that was about to be destroyed by a storm; an angel appeared and instantly harvested the crop, saving the peasants from starving. Founded the monastery at Bivongi, Italy; the house was later re-named in his hounour. Orphaned as a small child. Raised in the Torlonia Conservatory on Via Sant' Onofrio, under the guidance of the Daughters of Charity of Saint Vincent de Paul. Entered the Daughters' novitiate in Siena, Italy, but was forced to leave due to poor health. On retreat in 1891 she met Blessed Louis Tezza, procurator general of the Camillians. He had been thinking of founding a women's community for the care of the sick. He invited Josephine to help establish the new community, she prayed over it, and decided "yes." In 1892 she and two companions received the scapular of Camillian tertiaries, and a year later professed private vows, adding service to the sick, even at risk of their lives. They took their perpetual vows in 1895, and Josephine was elected Superior General. Blessed Louis was sent to Lima, Peru in 1900, responsibility for the new congregation rested with Mother Vannini, and under her leadership the congregation spread to France, Belgium and Argentina. Born to a wealthy and pious family, the daughter of Gutiérrez de Cabiedes and Rosaria de Arambarri y Mancebo. Rafeala was a pious girl, made her first Communion at age 11, and was given to long meditations on the suffering of Christ. In 1861, at age 18, she married the wealthy and pious Giuseppe Vilallonga of Catalonia. The couple had seven children of their own, and took in many relatives who were poor, sick, frail or neglected. In her mid-thirties, and with Giuseppe’s approval, Rafaela took personal vows of poverty, obedience and chastity. Widowed, she spent her life and fortune caring for others. She founded the Institute of the Sisters of Guardian Angels to work with abandoned and neglected children. Born to the nobility. Studied in Constantinople. Soldier and officer in the imperial army for four years. Adult convert to Christianity who read himself into the faith, and took his example from the words of Christ to the young rich man - he sold all his goods and became a hermit in Syria for several years. At one point he came back to the city; there he burned a pagan temple, and was imprisoned; he spent his time there bringing his jailers to Christianity. Released, he returned to the life of a hermit for several years, but felt called missionary work, and worked in Antioch, but with no success. Founded monasteries in Mesopotamia, Constantinople and Gomon, and at one point led 400 monks. 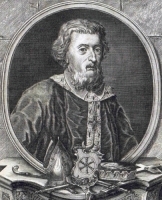 Converted Rabulas, bishop of Edessa. Alexander began the liturgical service in which his monks sang the Divine Office continuously day and night. Daughter of an imperial Roman official, Romana was drawn to Christianity. Around age 16, to avoid marriage, she fled her family home. With the help of an angel, she made it to the cave on Mount Soracte where Pope Saint Sylvester was hiding from the persecutions of Diocletian. She explained to him her desire for Christian religious life; he baptized her and left, leaving her the cave as a home. Her reputation for holiness soon spread, and she attracted so many students that they founded a community around her cave. While such a saint may well have lived in the cave, and such people certainly attracted would-be students and followers, the tales that grew up around her are likely pious fiction that was later mistaken for history. Daughter of Merewalh, King of Mercia, and Saint Ermenburga. Sister of Saint Mildred and Saint Mildgytha. Took the veil from archbishop Saint Theodore. Benedictine nun. Founded Much Wenlock abbey in Shropshire, England, and was abbess there. Miracle worker. Had a mysterious power over birds; they would avoid damaging the local crops when she asked them to. Ordained on 13 March 1937. Arrested by the Gestapo in 1939, Stefan was shuttled through the concentration camps Fort Seven, Stutthof, Grenzdorf, Oranienburg-Sachsenhausen and finally Dachau. Spiritual leader of other prisoners wherever he was imprisoned. He contracted typhus while working with fellow prisoners dying of the disease, and is thus considered a martyr of charity. Studied for the priesthood in Paris, France. Priest in Auvergne, France. Canon of the cathedral of Auvergne. He was the teacher of the young Saint Stephen of Muret. Milo’s reputation for piety led to the people of Benevento, Italy to choose him as their bishop where he served the remaining two years of his life. Born to a wealthy family, she grew up wanting and working to help the poor. Nun in the diocese of Como, Italy. Founded the Nursing Sisters of Our Lady of Sorrows. Spiritual student of Saint Aidan of Lindisfarne. Monk. Abbot at the abbey of Melrose, Scotland. Teacher and spiritual director of Saint Cuthbert of Lindisfarne and Saint Eghert. Bible scholar. Had the gift of prophecy. Noted preacher. Virgin martyr in the persecutions of Decius. Hermit in Syria. Spiritual teacher of many monks, including Saint Maro and Saint Polychronius. Benedictine monk at Saint-Evroult, Ouche, France. Abbot of Vendome, France. Bishop of Brescia, Italy for 40 years. Fierce opponent of Arianism. Priest in Rome, Italy who was known for his ministry to people imprisoned for their faith. Sixth-century desert hermit whose deep prayer life led to deep personal holiness. Benedictine monk in Sahagun, Leon, Spain. Bishop of Astorga, Spain in 1062. 73 Christians who were martyred together in the persecutions of Diocletian. We know no details about them, and only six of their names - Antigonus, Libius, Rogatianus, Rutilus, Senerotas and Syncrotas.